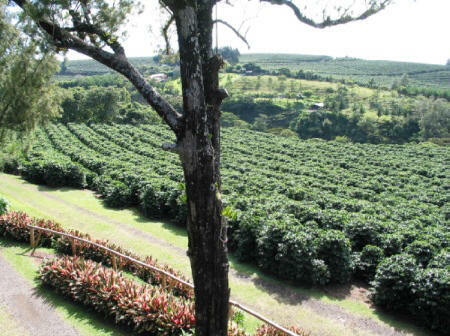 Poas Volcano, Coffee Farm stop, 2 Waterfalls, Lunch, Chocolate Tour in Rainforest. Only we offer this fantastic combination tour! ALL INCLUSIVE PRICE OF $120/PERSON. Discounts for children, families and groups. 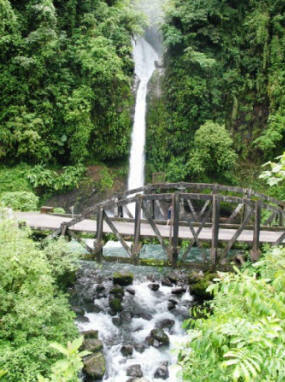 SEE "ALL IN A DAY FROM SAN JOSE . . . .
· 2 BEAUTIFUL WATERFALLS: ‘La Paz’ and ‘San Fernando' Falls. 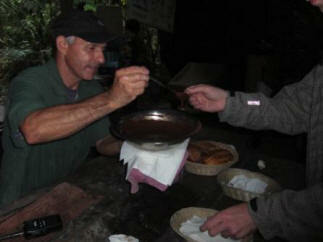 · CHOCOLATE HISTORY TOUR IN A PRIVATE RAINFOREST PRESERVE. Closed shoes only please, no sandals for Chocolate Tour. · SCENIC DRIVE BACK TO S.J. THROUGH A RAINFOREST NATIONAL PARK. · REFRESHMENTS from sodas, bottled water, fruit & BEER provided at no extra cost. or larger vans or buses. in C.R. and son of Costa Rican born mother with U.S. M.Sc. who retired as a U.S.
23 operating tours in C.R. SCENIC DRIVE TO POAS: After a 7:30 am pick-up from your S.J. area hotel (later in other areas) we’ll travel 11 miles on the Pan American Highway (or via other roads depending on your hotel's location) to the provincial capital of Alajuela to see 2 points of interest your knowledgeable guide will tell you about. From here our scenic drive towards the Poás Volcano Cloud Forest National Park takes us up the slopes of the Central Volcanic Mountain Range through beautiful landscape adorned with coffee, dairy, strawberry, flower and fern farms in addition to quaint typical small towns with well-kept homes. 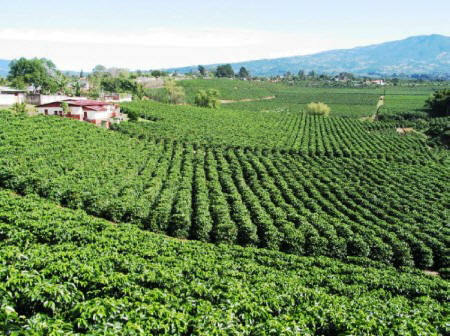 COFFEE PLANTATION SHOP to sample and purchase if you wish top quality roasted coffee while taking in the beautiful views of the rolling landscape of coffee plantations and of the Central Valley below. POAS VOLCANO: At approximately 9:30 a.m. we’ll enter the cloud forest of the Poás Volcano National Park where we'll walk 400 scenic yards on a paved pathway to the crater, located at a cool 8,500 ft. above sea level. 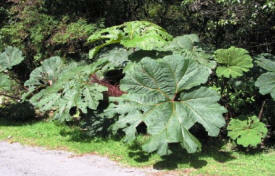 Your guide will show you the beautiful giant leaves of the “Poor Man’s Umbrella” plant, epiphytes (air plants) and other plant species unique to the lush tropical cloud forest ecosystem that lines the walk to the crater. From the crater’s rim you’ll have the unique experience of looking down 500 ft. into an active volcano crater that's nearly 3/4 of a mile in diameter and constantly emitting sulfur fumes and steam. The crater's array of colorful rock strata, aqua green colored acid lake surrounded by tropical could forest and barren old lava floe rock formations together with the spectacular views of the surrounding landscape, gives your experienced professional guide plenty to tell you about. An optional walk via a rustic trail through the cloud forest back to the vehicle is available. VIEW & FRUIT STOPS: After leaving Poás around 10:30 a.m. we'll make brief stops with a fantastic high view of the central valley below, and later further down the mountain at a roadside fruit stand to sample delicious fresh strawberries, other local fruit and snacks safe to eat. 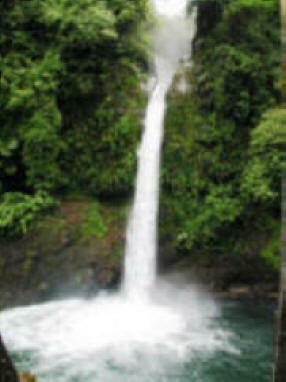 WATERFALLS: By 11:15 a.m. we’ll arrive at the first of 2 spectacular waterfalls, "La Paz" (“The Peace"). This impressive waterfall is a triple sault of pristine water producing an effervescent pool of water surrounded by lush rainforest vegetation. A road bridge is located directly in front of the falls giving you an excellent spot to view the falls. HUMMINGBIRDS: A few miles down the scenic road with forest lined canyons and farm land we'll stop at a former typical country restaurant with a breathtaking view of the San Fernando Falls and enjoy a hummingbird gallery. A 300 ft. high spout of pristine water spilling out of an impressive rainforest lined canyon in the near distance, provides a spectacular background to a wide variety of hummingbirds feeding from feeders giving you an excellent opportunity to admire and photograph these amazing birds. Restrooms are available here. LUNCH: Here in front of the San Fernando Falls we'll stop for lunch at rustic typical Costa Rican restaurant with a variety of delicious local food and refreshments. CHOCOLATE HISTORY TOUR in the RAINFOREST: Following lunch we'll drive about 1 hour after down the Caribbean slopes of the Central Mountain Range on an ever scenic route to the Caribbean Plains (but some 50 miles or 80 kms inland from the Caribbean coast) where around 1:30 p.m. we'll arrive at a private Rainforest Preserve which borders both sides of the Sarapiquí River. To start the 2 hour Chocolate Tour you'll be led by a trained guide across a 160 meter or 500 ft long cable suspension pedestrian bridge high above and across the white water rapids of the scenic jungle-lined Sarapiquí River onto a ½ hour trail walk into the rainforest to a former cocoa-growing plot and shelter. There you will enjoy a presentation of how chocolate was first made by the Indians of Central and South America by way of an artisan processes that transforms the cacao or cocoa fruit into chocolate from harvest, fermentation, sun drying, and grinding etc. While the story of pre- and post-colonial chocolate is told along with the history of it's cultivation by the Spanish and how it progressed into becoming popular in Europe, you'll be able to taste and see how fresh made chocolate in its pure form is made and in different stages of its fabrication through its history while learning about the difference to modern chocolate. After the chocolate tour presentation you'll walk back the ½ hour scenic trail through the rainforest along the banks of the Sarapiquí River to the hammock pedestrian bridge across the river to the reception area where you'll have the opportunity to buy hand-made organic chocolate made by Amazilia del Caribe Women’s Association. Closed shoes only please, no sandals during the chocolate tour. Restrooms are available at the reception. We carry a full compliment of refreshments, from cold beer to sodas & bottled water in our vehicles, available all day long at no extra cost. Returning to San José a different way you’ll enjoy a scenic 2 hour 70 mile drive back with a ½ hr or 20 miles of it being through the impressive Braullio Carrillo Rainforest National Park. Here with weather conditions and visibility permitting, you'll be to take in the views of the forest lined canyons before taking you back to your hotel or place of lodging around 6:00 p.m. This can vary though. You'll receive payment confirmation from PayPal on our behalf. This tour description is of the sole right of it's creator and its strictly prohibited to copy and publish any part of this document.